New Balance has entered the 2017 season with a budding golf collection that features prices ranging from $85-$190. Coming in at $119.99, the 2004 golf shoes provide some excellent features in a flexible and light weight profile that is expected to move with the golfers feet naturally. 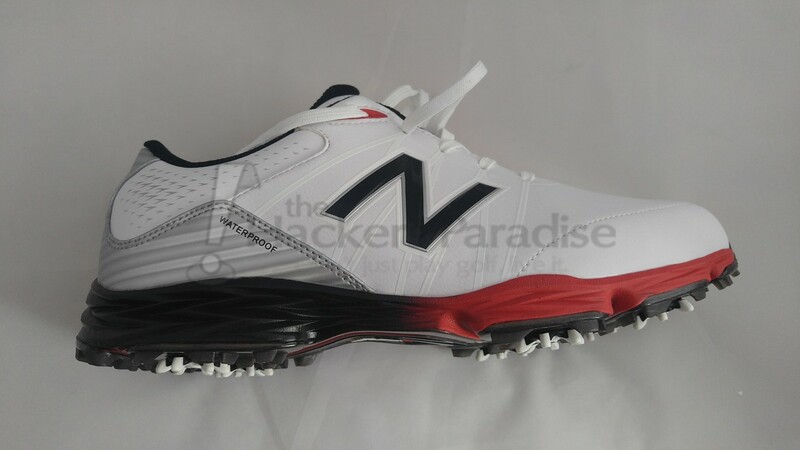 New Balance urges golfers to ‘play in the fairway in lasting comfort’ with the 2004 golf shoes. The 2004 golf shoe for men features a Champ Slim-Lok Zarma Tour® cleat system for stellar traction and stability. Drawing the attention of the eye immediately is the familiar “N” logo of New Balance, which breeds confidence in comfortability and performance from a brand well known for their shoe construction. While the shoe has a reasonable amount of give in the material, there is added stability in the heel section, noticed mostly on the exterior of the boot. Inside on the heel bed rests a well-padded mid height profile that introduced only a small amount of fatigue during the first round. Moving to the sole, New Balance has provided golfers with seven spikes and a series of elements surrounding them that elevate the likelihood of stability throughout the swing. More impressively, they have incorporated this pattern around a lot of give, which helps reduce that feeling of an overly structured golf shoe. 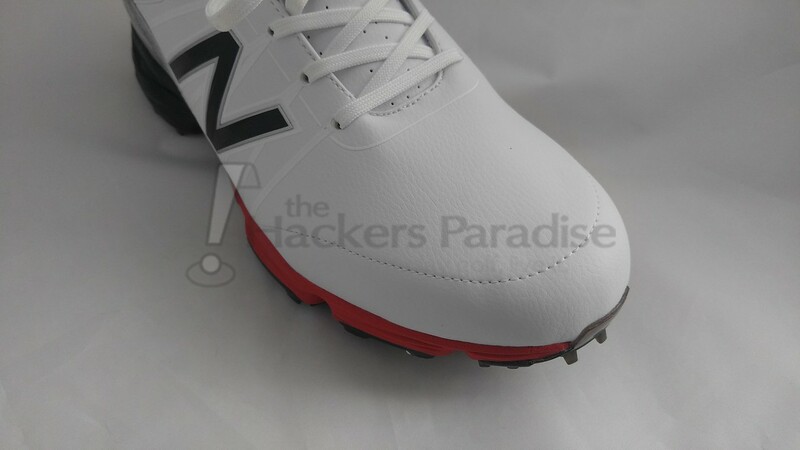 This is something that speaks more to the comfort and control that New Balance brings to their shoe, and is a great feature to see carry over into their golf shoe offerings. The compliments received during testing rested mostly on the brand, with curiosity of comfort and eagerness to try on their own. As this profile is quite traditional overall, it is a nice mix of performance and practicality that will suit a lot of golfers’ preferences. Whether done for longevity or visuals, the material that stretches from the lace holes to the base of the shoe really tie in the logo well, and limit the whitewashing of the front portion of the shoe. To the heel portion of the New Balance 2004 shoes, various materials are brought in to not only shield the golfer from the elements faced during a round, but also to liven the shoe look by adding some horizontal lines and other graphics. Once again, a great way to break up the monotony of a white golf shoe without going overboard and taking away the potential to present as a traditional profile. For this particular colorway (the 2004 comes in three options), the red really jumps out from the sole and top lace eyelet. It blends brilliantly with the white boot and black heel portion to provide enough color to pair with the Sunday best, without going full on red. It also helps the zigzag pattern of the sole pop off the shoe. The one and only element that did not impress the eyes was the stitching that runs across the toe bed. It likely serves an important purpose in keeping the shoe together, however it was definitely concerning to think about the discoloration of the fabric looking forward twenty or so rounds in all conditions, and how it would visually pop off as an off white. Time will certainly tell. As an avid walker, it is incredibly important to have a shoe that can not only withstand the time on the feet walking around a golf course, but also the elements faced like rain, sand, and dirt. The last two rounds of the review process were played on wet ground, and at no point did it seem like the potential to get wet feet came into play. 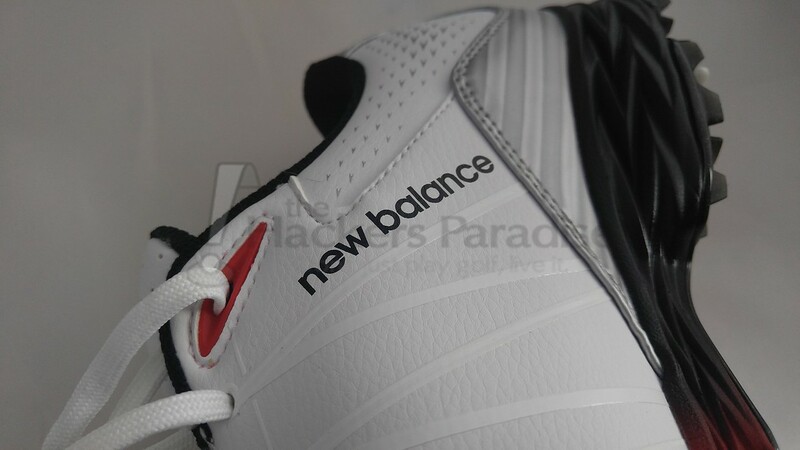 As one can clearly see by the heel portion of the 2004 from New Balance, added efforts to keep that section dry and ahead of the weather/ground really paid off for this reviewer. Any dirt or water that hit the silver section could be easily removed, eliminating concerns about losing that new look to a white backing. The exoskeleton used to shape the sole made a big difference for a shoe that presents itself on the exterior as a structured golf shoe. From someone who faces recurring toe injuries (our former athletic lives haunt us), wearing an overly structured shoe for 18 holes of walking can lead to tremendous pain and discomfort. Shockingly, the 2004 gave enough that fatigue was at an absolute minimum, as the foot was free to move more naturally. While this was something to be expected from this company, it was a very satisfying realization. 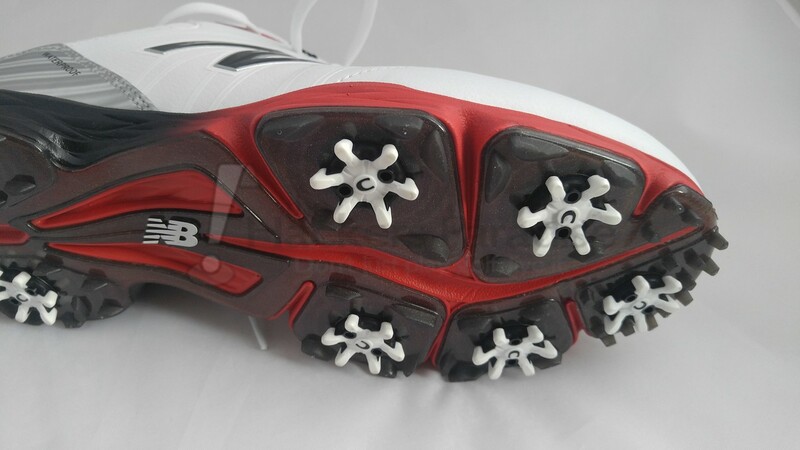 The shoes provided for review were the wide profile, and it will please many golfers to know that there is plenty of room in the mid to toe section of the shoe while maintaining some nice stability in the heel section. As a traditionally narrow wearing shoe person, this reviewer had no issues maintaining heel control throughout the rounds with even a minimal/loose shoe tie. At no fault of their own, a company like New Balance should be held to a very high standard when it comes to shoe comfort considering how strong their portfolio is. Despite the very reasonable MSRP of $119.99, the 2004 not only met expectations, but exceeded them in numerous categories. With fantastic color combinations like blue/grey, red/white, and black/green, golfers will find a shoe that looks great with their preferred style with a nice balance of features. For more information on the New Balance 2004 golf shoes, visit www.NewBalance.com. Great review Dan! I like the look, sound and price point of these. The shoe sounds like it’s got a lot of value for it’s price point, and as someone who also walks a lot, the comfort level over time is a big thing for me. When my spikes need replacing, which will probably be after this season, as a fan of New Balance fits in general these will be high up on my list to check out. Nice review Dan. I’ll be checking these out for sure. Great review Dan – I agree on the stitching on the toe bed, not really a fan. However I like the comfort that you had with these shoes and the ability to keep the white clean. Solid price point as well. Was traction solid with the spikes too?